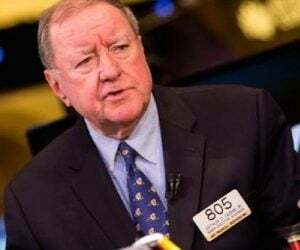 Today the man who has become legendary for his predictions on QE, historic moves in currencies, spoke with King World News about the biggest crisis the world has ever faced and the silver breakout. Paper money system – currencies going to zero. The above list of risks is certainly not conclusive. Egon von Greyerz continues: “But the world has become totally immune to risk. No market has priced in these risks. If they did, we would not have stock, bond, and property markets at historical tops and overvaluations. Central banks have succeeded in alchemy for such a long time that markets totally ignore risk. It seems that unlimited money printing, credit expansion, interest rate manipulation and currency debasement is the permanent solution for a world living above its means. But to totally fool the people, news must also be manipulated, and this is where fake news comes in. Financial and economic figures must be massaged and the basis of the calculations constantly changed. So here we stand in front of the biggest crisis that the world has ever faced and no one is the slightest bit concerned. But this is normally the case at the end of a bubble era. Before the 1929 crash and 1930s depression, optimism was at a peak and both market participants and politicians were certain that this was a new paradigm which would continue for ever. While most financial markets are not currently worried about risk, the currency market is quietly reflecting the world’s view of the US economy and markets as well as the US political situation. The Forex market is very difficult to manipulate. With daily global volume of over $5 trillion, no single central bank can move this market. Concerted central bank forex manipulation has worked in the past. But the days of cooperation are gone. Today every country wants to debase its currency. This is why we are seeing constant competitive devaluations in a race to the bottom. In the last 100 years, all currencies have lost 97-99% of their purchasing power. The final move to zero will probably take place in the next 5-8 years. And that involves another 100% loss from here. Most Americans don’t worry about the value of their currency. Therefore they are not aware that if they visited Switzerland in 1971, they would have received 4.30 Swiss Francs for 1 dollar. Today they receive 0.94 Swiss cents. This is a loss of 80% in purchasing power against the Swiss Franc since Nixon stopped the gold backing of the dollar. Currency moves reveal the economic (mis-) management of a country. 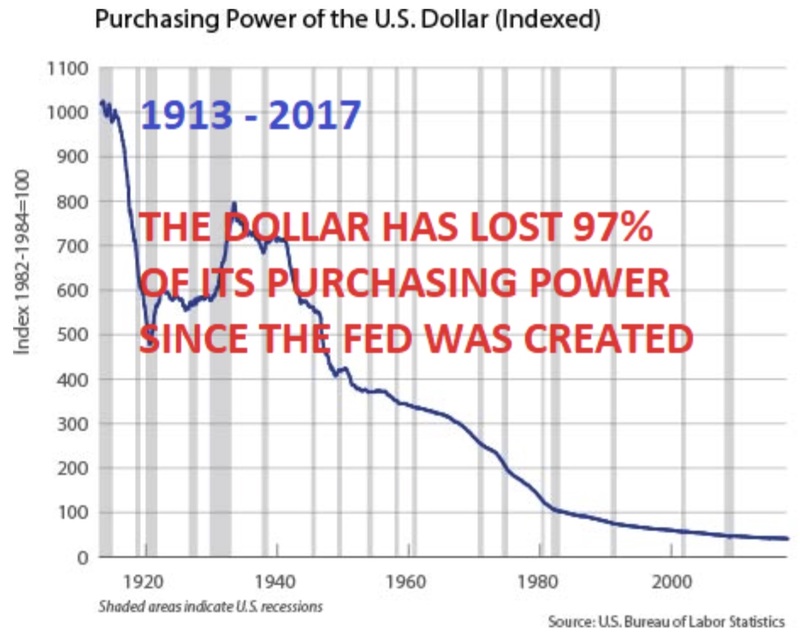 The constant loss of value of the dollar against most other countries in the last few decades clearly depicts that the US is on the road to ruin. The dollar tells the truth and it tells an ugly truth. The remaining days of the dollar as the reserve currency of the world are very limited. The world doesn’t need a reserve currency and certainly not one which is in a chronic decline due to economic mismanagement. The days of the petrodollar are coming to an end. China and Russia will see to that. There is very little respect in Europe or in Asia for the current US political situation. There is even less respect for the economic situation of the US and its currency. Just after Trump was elected the dollar reacted in the opposite direction of US markets. 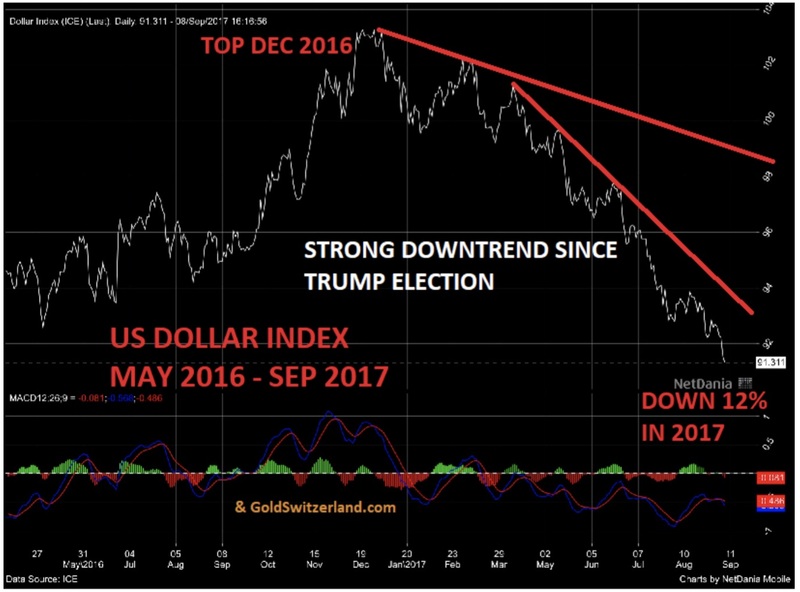 The dollar peaked in December 2016 and is now down against all currencies. The dollar index is down 12% in 2017. The Euro is up 16% against the dollar in the last nine months. The Euro is the currency of a failed political experiment. A one for all currency was always doomed to fail, even before it was launched. How could Greece or Portugal ever have the same currency as Germany. The efficient Germans with their very strong industrial base have benefitted enormously from a relatively weak euro, while many inefficient Mediterranean EU countries have become debt laden and uncompetitive due to a currency which is too strong. But in spite of the problems in Euroland, the euro has outperformed the dollar by 16% in 2017. As we know, there is no absolute value for a currency. They are all virtually worthless and only backed by debt. But it is a relative game. And relatively the world’s reserve currency, the dollar, is losing value fast against an artificial construction called euro. The euro has been doomed out for a number of years but is still winning the war against the dollar. So what has the dollar got going for it? 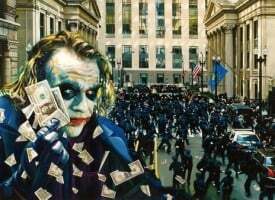 The US is the biggest financial empire in the world and the greenback was desired by most people around the globe for many decades. Like all empires the US world dominance is now crumbling and so is the dollar. The dollar strength was based on the US being the mightiest industrial nation in the world with low debts and a balance of payment surplus. But that gradually changed, starting already in the early 1960s when the US couldn’t afford to make ends meet. Since then the US debt has gone up every single year for 56 years. Also, the US has had a trade deficit every year for the last 45 years. As the dollar came under attack in the early 1970s, Nixon took the fatal decision to back the dollar by nothing. 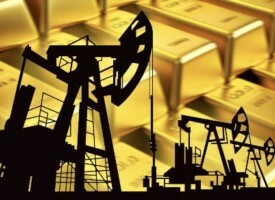 When gold, on August 15th, 1971, was removed from backing the dollar and the world’s currency system, few realized the disastrous effects this decision would have for the world. Global debt has since grown exponentially and most currencies have fallen by 70-80% in real terms. 2017 has been a year when many US investors have lost money as well as purchasing power. So how can that be possible when most investments have been strong measured in dollars? Americans seldom worry about what happens to their currency since they measure their wealth in dollars. But on an international purchasing power basis, dollar investors are losing out in 2017. The chart below shows the Dow down 10% in Euros since March 2017. Since we are looking at the end of a major cycle, bubbles have a tendency to grow bigger than you thought would be possible. This is why we might see strength in stocks for a few months yet and also credit markets continuing to ignore risk. But very few investors have become wealthy by holding on to the end of a major bull market. Look at the Nasdaq at the end of the 1990s. It went up 5x between 1996 and early 2000 and then lost 80%. Many Nasdaq stocks lost 100%. Between 2009 and 2017 we have seen the Nasdaq go up 5x again. Many leading Nasdaq stocks are now trading on stratospheric valuations. It would be surprising to see only an 80% correction this time. More likely it will be 90-95% in the next few years. Whichever catalyst will trigger the next crisis in the world, we will only know afterwards. What is certain is that it will come. When is of course the big question. Will this bubble expand further or will it start imploding this autumn? No one knows the answer. What we do know is that we are dealing with unprecedented risk. The risk is also immeasurable. When the next financial crisis comes, it will be bigger than in 2006-9. 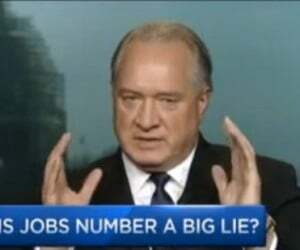 We also know that the tools that central banks applied then are unlikely to work the next time. Money printing no longer has any effect on stimulating the economy. It only creates asset bubbles. And the interest rate weapon no longer exists. In 2006 interest rates around the world were around 5-6%. Today there are 20 countries with negative rates and most of the rest are just above zero. This won’t stop central banks from a final round of unlimited money printing leading to hyperinflation and the final move of currencies to zero. The asset and wealth destruction will be catastrophic. In real terms, most assets will decline by 75–99%. 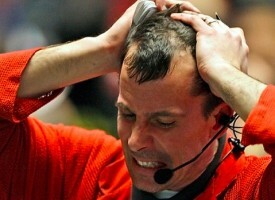 Most investors will not heed this warning and will not get out of markets until they have lost most of their money. But even for the people who consider these forecast as scaremongering, would it not be worth considering some insurance? If there is a high risk of a fire or a flood, most people would insure their house if they could. So why are so few insuring financial risk? Clearly because they can’t see it. But even if investors don’t see any of these risk factors materializing, wouldn’t it still be worthwhile to own some insurance. Conventional financial insurance will not work when we are looking at systemic risk. Puts, swaps and other derivative instruments are unlikely to pay out due to counterparty failure. The best insurance is real assets, Normally, land and buildings have withstood most catastrophes as long as they are unencumbered. The problem with the property market today is that in most countries it is massively overvalued. The best real assets are physical gold and silver as long as they are kept outside the banking system. As I showed in my KWN article last week, gold has now resumed the uptrend to new highs after a long correction. The same goes for silver. Silver broke out of a 5 year downtrend in 2016. 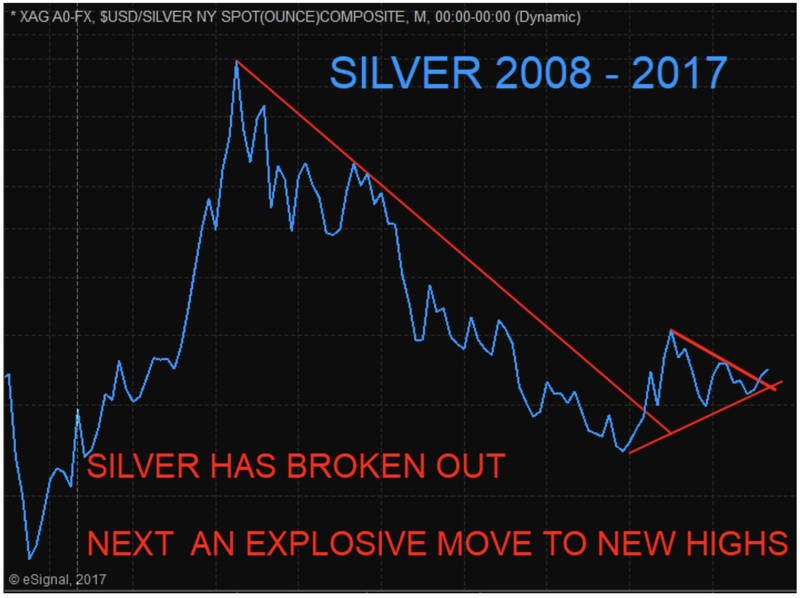 As the chart below shows, silver has again broken out of a 1 year correction and is now ready to move up explosively. For investors who don’t already own precious metals, this is the time to buy physical gold and silver. When you buy insurance, you must have enough cover to protect other assets and to be able to live comfortably off your insurance. 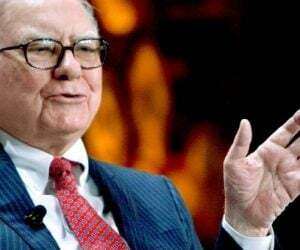 I do realize that most investors are not in that fortunate position. But whether you buy a few ounces or a few tonnes of gold, it is absolutely critical to own some insurance cover. So what percentage of financial assets should be in gold and silver? It could be anywhere from 5% to well over 50% depending on the investor’s situation. We would say that 20-25% should be a minimum. For all investors, owning proper insurance cover in the form of gold and silver, against what is probably the biggest risk situation in history will prove to be an extremely wise decision.” ***KWN has now released the remarkable audio interview with whistleblower and London metals trader Andrew Maguire discussing a major short squeeze developing in the gold market, why the Goldman Sachs admission is such a big deal and much more, and you can listen to it by CLICKING HERE OR ON THE IMAGE BELOW. ***ALSO JUST RELEASED: Whistleblower Andrew Maguire Exposed 14 Days Ago ‘Vampire Squid’ Goldman Sachs Was Moving In For The Kill. Maguire Now Says Admission By Goldman’s Currie Is A Big Deal CLICK HERE.